Debris covers a portion of Inskeep Cratty Road this morning after recent flooding. Inskeep Cratty Road was one of two roadways closed due to high water, the other being North Lewisburg Road. This morning’s freezing flooding in Union County created obstacles for local authorities and one local animal shelter. 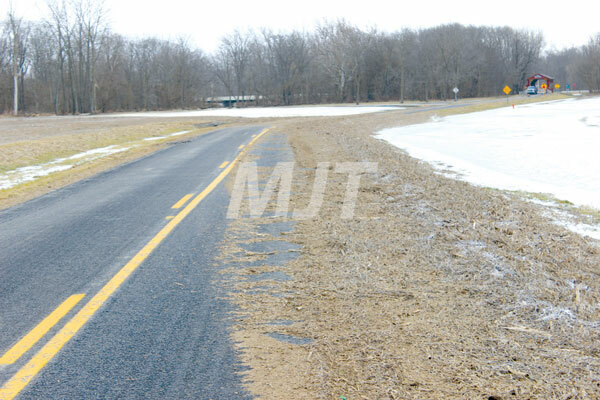 According to Casey Rausch, assistant superintendent at the Union County Engineer’s Office, Inskeep-Cratty and North Lewisburg roads were the only two closed. He noted several roads had signs warning of high water. He said overall, roads near the Big Darby watershed were hit the hardest. He said local officials also dealt with a few trees that were knocked over. The temperatures dropped drastically last night, freezing much of the water left by the heavy rain from Thursday. Rausch said thankfully, the drop in temperature lined up nicely with the arrival of high winds, which dried many of the area’s roadways. One local organization saw some serious flooding, and got some help from the community. The Canine Collective in Plain City had six inches of water in some areas, according to volunteer Phil Keay. The problem became apparent around midday Thursday. Keay said the collective put a call out for local residents who were willing to quickly foster dogs while the water receded. “Basically, the phones just blew up,” Keay said. Keay said the organization ended up evacuating about 30 dogs to short-term foster homes, and 10 dogs were kept in “dry and safe” parts of the kennel. According to Keay, many of those dogs will likely be back at the kennel by Saturday, though he said some homes have requested paperwork to keep their dogs permanently. Keay said the Canine Collective has never experienced flooding as bad as yesterday’s situation. He said there were draining ditches added to the property a few years ago. “Clearly, that’s not enough,” he said. He said the organization is asking the community for advice on flood mitigation. In the meantime, Keay said the organization wants to give a “big, big thank you to the community” for rising to the occasion and providing shelter for so many animals. “It really was fantastic,” Keay said. Rausch urged residents to use caution this morning as they drive to and from places. He said when motorists see high water, it’s better to simply find an alternate route. “If you see water, just don’t go through it,” Rausch said.